Cantabile Choir was founded in 2012 by Maria Leśniak. At its beginnings, the choir was largely made up of members from the old Agnus Dei Choir and under this name performed in the first three “God is Born” concerts. 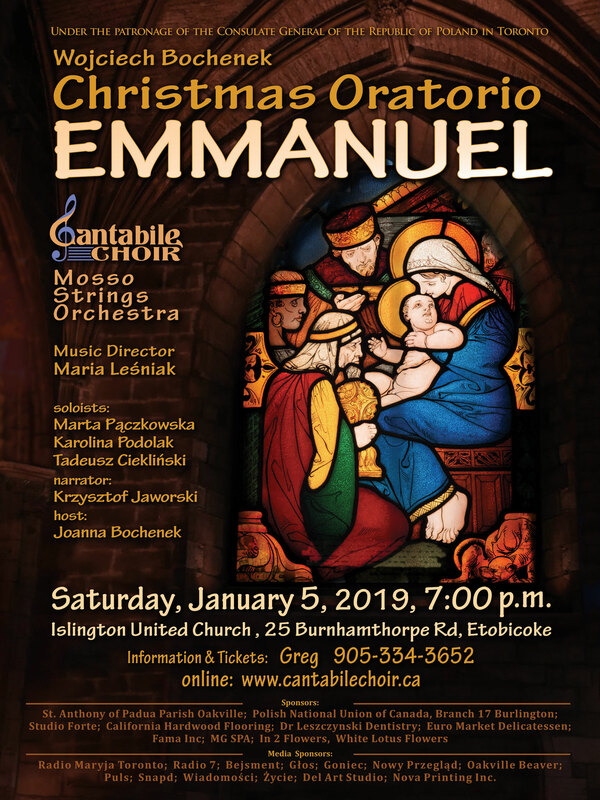 The Oakville-based Cantabile Choir aims to offer a professional singing experience with a varied repertoire, while coming from and celebrating Polish culture. The choir participates in a number of diverse concerts throughout the year. In 2014 Cantabile Choir joined the St. Anthony of Padua Parish as a church choir singing on major occasions. The choir's most recent major projects were the premiere of the Lenten Oratorio in April 2018 and taking part in the Winter Wonderland December 2018 concert. We Welcome Everyone. Wszystkich Zapraszamy!